Where exactly do you put your rifles and shotguns at home? That’s the question for many people in the US, and for some the best answer to this is the Stack-On 16 Gun Cabinet. How many people in the US need storage space for hunting rifles? In 2011, a national survey found that the total number of hunters in the US were about 13.7 million. That’s more people hunting than there are people playing baseball, which is supposedly the country’s national sport. The numbers are also increasing dramatically for women who hunt, as there are 72% more of them than there were in 2007. However, these rifles need to be secured. If you own several of these, you don’t want children or strangers getting at them too easily. 2 Whom is the Stack-On 16 Gun Safe/Cabinet Designed For? It’s very secure. Your rifles are safe since the plate is resistant to drilling, the hinges are hidden, and the bolts are tough. If it’s bolted to the floor and wall, the thieves can’t take it with them. It looks great. It sure looks better than a plain steel cabinet. You can put this on display and it can make a room look good. It’s very easy to use. There are no batteries and no complicated electronics. Just use the combination lock and you’re good to go hunting. It’s easy to take it upstairs. Just have 2 people lift it up to the upper floors. 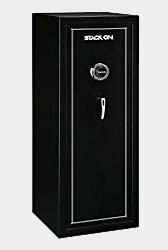 Whom is the Stack-On 16 Gun Safe/Cabinet Designed For? Storage: that’s what the Stack-On 16 Gun Tactical Cabinet is for. You have a suitable place to store your hunting rifles in a way that keeps the rifles in good condition, while you can also use it to store your other firearms accessories. It’s very secure too. With the lock and the use of the hardened steel plate, thieves and curious children won’t be able to open this lock easily. 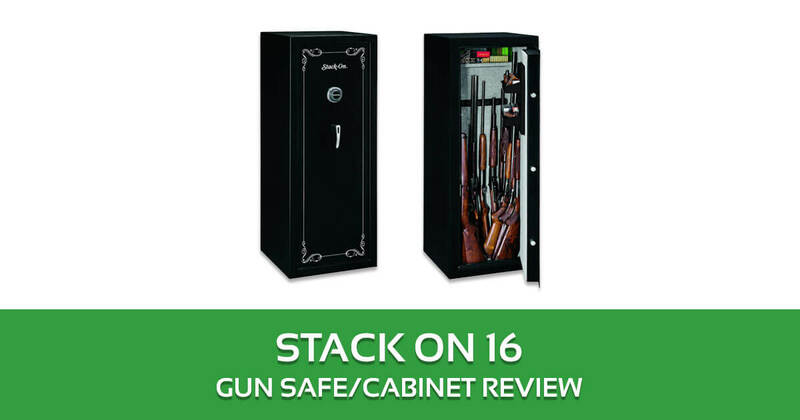 So this Stack-On SS-16-MB-C cabinet is designed for families with lots of hunting rifles (16 at the most) who need secure storage for their firearms. It’s also for those who use hunting bows, as these can fit inside too. It can hold up to 16 firearms that are 54 inches long at the most. So that should be enough for rifle collectors. The interior is fully carpeted so that the rifles don’t get scuffed. It’s also great for families which have many of the family members hunting. Even if each family member has 2 or 3 rifles, they can all fit. Even if you don’t use hunting rifles and use hunting bows instead, this is still a great option. You can fit those things inside too. It’s also easy to put in and organize other firearms accessories inside. You just have the single removable shelf on top so you’re not cluttered by too many shelves. In addition, you also have two drawers by the other side of the door. All these storage compartments can be used for ammo and other firearms- related equipment. You can also put in other stuff too. It uses a combination lock. That means it’s very reliable since you’re not using an electronic lock that requires batteries. Electronic locks are often subject to weird flaws and bugs. Also, you have to keep checking that the batteries are still good. With a combination lock, it’s all mechanical. There are no electronic bugs to worry about, and there’s no need to keep buying batteries. It’s easy to use too. They’re the de facto locks used in various school lockers all over the country. Add the drill resistant plate and the 6 locking points, and you know this is very secure. The weight of the safe is also light enough for 2 people to lift it together to an upper floor up the stairs. But a lone thief won’t be able to lift this up easily. For maximum security, you can also bolt this safe to the floor and to the wall. It comes with pre-drilled holes. It looks great too. You won’t be embarrassed putting this in plain sight in your living room or bedroom. You have 2 choices for colors. You can choose green or black, with chrome accents. It looks great. You can put this in plain view, and it won’t make your home interior look bad. It’s not too heavy for use on upper floors. Two people can carry it easily. It’s quite secure. The steel plate, the lock, concealed hinges, and the mounting for the floor and wall keeps your rifles from other people. The interior is specifically designed for hunting rifles. You can store up to 16 rifles. It doesn’t really offer excellent protection against fire. While it’s not exactly flammable, your rifles may suffer from damage if the fire is strong enough. You can’t change the combination for the lock. The number combination assigned to you is what you have to use. Can you really put in a hunting bow? The cabinet measures 55 inches high, 20.71 inches wide, and 17.27 inches deep. How hard is it to bolt to the floor? It’s actually easy. The hard part is drilling the holes, and you have predrilled holes already. So you just need the screws. It’s nice to have a good-looking cabinet that offers secure storage for your rifles. You don’t have to worry about your kids getting into rifle shenanigans. Inside, you can fit 16 rifles neatly, and you also have drawers and a shelf for other items. All in all, the Stack-On 16 Gun Cabinet a great storage option to put in all the family hunting rifles.